Averil Dickson uses part of the trail every day. Mountain vistas, forest trails, vineyards and farms with emus, llamas, cows and sheep, are just some of the breathtaking sights along the Lilydale to Warburton Trail. Yarra Ranges Council is offering prizes for the best photos from along the 40 kilometre trail shared on Instagram or Facebook. Entrants need to use the BestofWarby hashtag for the chance to win a $200 voucher to the Killara Estate cellar door or a $100 Healesville Sanctuary voucher. They should first follow @yrcouncil and ensure their posts are public. 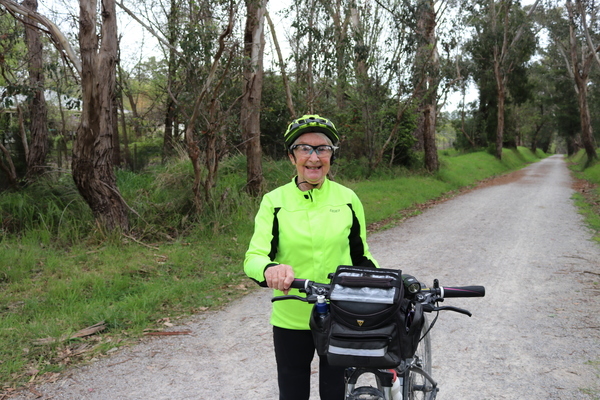 Lilydale’s Averil Dickson rides part of the trail daily and said it was wonderful how social, friendly and respectful the other trail users were. “It’s a good idea if we keep left so it’s safe for us to pass each other, and it’s also a good idea to say hello to each other,” she said. As a reminder, the council installed code of conduct signage along the trail, indicating that cyclists must give way to pedestrians. “The etiquette signage is a good reminder for us cyclists to slow down and use the bell when passing others on the trail or to call out to let others know you’re passing,” Ms Dickson said. The photo competition closes Wednesday 14 November at 5pm.